The huge state of Alaska is massive in land size rather than population. One notable different is in the large number of native American Indians, which would be important in Alaska genealogy, who have resided in this region for centuries. The southeastern coastal Indians tribes are Tlingit, Haida and Tsimshian. The Athabaskan tribes are in the central and northern regions of Alaska. The Aleut tribes are located in the Aleutian Islands. The group commonly referred to Eskimos are two main native Indian groups which are named Inuit and Yupik. A related group to the Eskimos are the Aleut tribe. Starting in 1741 there were Russian explorers to the Alaskan region, but no real settlements were established yet. Between 1774 and 1791, Spain made an occasional attempt to explore the Pacific coast of Alaska, but again without any success. By 1784, Russia was able to establish a permanent settlement at Three Saints Bay on Kodiak Island, mostly to keep the English from coming in and dominating the developing fur trade. American expeditions also interested in fur trade arrived in 1789. By 1799 there was an agreement between the United States and Russia to form company to grant fur trading rights to America for 20 years. The trade agreement was successful and was renewed in 1821. At the same time Russia made an agreement with England to lease areas near Cross Sound in the southeastern region for fur trade. The English with the Hudson Bay Company remained an influence in the area for another thirty years. By the 1850s, there was interest in coal mining in Alaska. The Russian tried the mining with just a little success and then whaling, but never had much success. Before 1860, the Russians were ready to pull out of Alaska. Gold was discovered in 1861 at Telegraph Creek at the Stikine River. Then, the U. S. Secretary of State William H. Seward negotiated in March 1867 with Russia to purchase 375 million acres of the Alaskan lands for $7.2 million dollars. For the next ten years, Alaska is under U. S. military rule. Another gold strike was made in 1880 by Joe Juneau and Richard Harris on the Gastineau Channel. A new mining district was established. Then by 1885 the most famous gold mine was located by John Trendwell and named the ‘Treadwell’ as well as three additional nearby mines opened. More people start to come into Alaska to work the mines, but no major gold rush like was in California in 1849. Then in 1893 gold was discovered on Birch Creek and the massive Klondike Gold Rush was underway. The Nome Gold Rush began in 1898. Throughout the 1890s the discovery of major gold mines brought people from around the world to Alaska, over 20,000 just in Nome. To assist in transportation the Yukon Railroad was completed by 1900 and the capital was established in Juneau. Telegraph service comes to the region in the early 20th century. After World War One, salmon fishing becomes a big industry bring more settlers to the area, mostly from the United States, especially from the western states. In the 1920s, the Alaskan Railroad was completed. Doing Alaskan genealogy it is interesting to find the workers who built the railroad lived in tents, but eventually remained to form the town of Anchorage. In 1940s the Alaskan Highway was opened allowing auto and truck transportation from Alaska through Canada and into the western states of the United States. 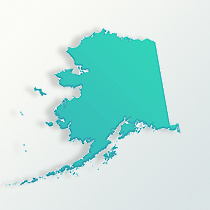 In January 1959 Alaska becomes the 49th state in the United States. By the 1960s the population of Alaska was about 250,000, including the native Indians. In the 1970s an oil pipeline was constructed which will bring petroleum from oil wells in Alaska to the lower 48 states. This also brings thousands of new people to live in Alaska. With the increased interest in Alaska and what it had to offer, the population in Anchorage alone was 250,000 by the 1990s. The state has approximately 626,000 people of which 69 percent is white and nearly 16 percent is native Alaskan Indian.